Calcium and Vitamin D are two main nutrients we all need in our diet for healthy growth and development, especially in children. Calcium helps us build and maintain strong bones and teeth, very important for the growing children attending our clubs! What many people don’t realize is that one of the main roles of vitamin D is to help absorb the calcium in our bodies from the foods we eat. In turn, eating calcium rich foods can be of no benefit if your body does not have the vitamin D it requires to help you absorb it. Since vitamin D is known as the “sunshine vitamin” and we live in a climate that we get limited sun exposure throughout the year, we may have to consume a little bit extra of those foods that are a good source of vitamin D.
http://www.kidseatsmart.ca/wp-content/uploads/2018/07/KidsEatSmartColour_Logo_340x156-300x138.png 0 0 admin http://www.kidseatsmart.ca/wp-content/uploads/2018/07/KidsEatSmartColour_Logo_340x156-300x138.png admin2015-01-29 19:54:342015-01-29 19:54:34Vitamin D in the Winter Months! In a small bowl mix together the greek yogurt and granola, then sprinkle over the fruit. Bake at 350F for 20 minutes or until golden and crispy. Exam Times = Busy Mornings! With many of our students preparing for midterm exams throughout the province this week, they may be feeling very overwhelmed and busy. Often the first thing to fall to the wayside when we are busy is eating! http://www.kidseatsmart.ca/wp-content/uploads/2018/07/KidsEatSmartColour_Logo_340x156-300x138.png 0 0 admin http://www.kidseatsmart.ca/wp-content/uploads/2018/07/KidsEatSmartColour_Logo_340x156-300x138.png admin2015-01-22 19:10:162015-01-22 19:10:16Exam Times = Busy Mornings! Getting Your Kids in the Kitchen! Getting your kids in the kitchen can not only make dinner time easier, it can also help your kids develop cooking skills. Younger kids can help set the table and take drink orders. Older kids can help chop vegetables with a soft knife, toss salads or pastas, and pretty much do anything under supervision of an adult. Having everyone involved can make meal time more exciting for the kids and help alleviate all the work from mom and dad! http://www.kidseatsmart.ca/wp-content/uploads/2018/07/KidsEatSmartColour_Logo_340x156-300x138.png 0 0 admin http://www.kidseatsmart.ca/wp-content/uploads/2018/07/KidsEatSmartColour_Logo_340x156-300x138.png admin2015-01-20 19:17:512015-01-20 19:17:51Getting Your Kids in the Kitchen! Check out this neat recipe your kids will love! Then, chop up some berries very finely or use frozen berries. Then pour1 tablespoon of pancake mix onto a heated and well greased skillet. You can then spread the mix out a bit to thin it out, so your pancakes aren’t too puffy at the end. Then, scoop a spoonful of berries to the center, and spread them out as best you can. Then (this is the hardest part), drizzle the batter over the berries. No need to pile another clump of batter on, simple drizzle to cover them up! Then, flip the pancake to cook the other side! http://www.kidseatsmart.ca/wp-content/uploads/2018/07/KidsEatSmartColour_Logo_340x156-300x138.png 0 0 admin http://www.kidseatsmart.ca/wp-content/uploads/2018/07/KidsEatSmartColour_Logo_340x156-300x138.png admin2015-01-15 20:12:342015-01-15 20:12:34Inside Out Pancakes! Making healthy foods fun and exciting for kids can encourage them to choose healthier options more often. Sometimes children say they don’t like a particular food, but if offered in a different or creative way they will often try it and like it! Check out this simple idea as a neat snack for your kids to try after school! Some people associate smoothies with summer but smoothies can be a year round delicious start to your day. Smoothies can kick start your metabolism and give you that energy boost you need to get yourself out the door on those cold winter mornings. 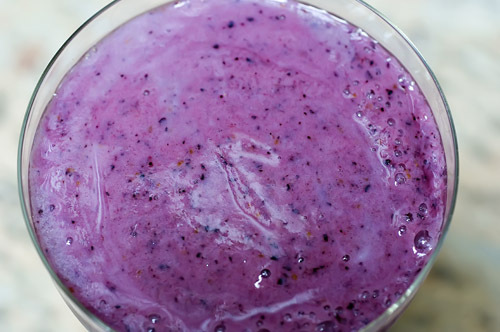 Having frozen fruit on hand makes smoothies a breeze to whip up for breakfast. The addition of a smoothie to the morning menu can really help increase your fruit intake for the day. Serve your smoothie with a side of whole wheat toast and a boiled egg and you have a well balanced breakfast which includes foods from all 4 food groups. Your kids will love this delicious and nutritious breakfast! Now that the new year is here and Kids Eat Smart Clubs are staring up again it’s important to have a look at our menu’s and ensure that each meal is planned with the recommended daily food groups. Here is an example of a well balanced KES breakfast! A Kids Eat Smart Club menu should provide foods from 3 of the 4 food groups for breakfast and 2 of the 4 food groups for snack. Including milk and fruit daily is essential to providing a well balanced meal for your club. For more info on recommended food guide servings for a variety of ages check out Eating well with Canada’s Food Guide for more detailed information. http://www.kidseatsmart.ca/wp-content/uploads/2018/07/KidsEatSmartColour_Logo_340x156-300x138.png 0 0 admin http://www.kidseatsmart.ca/wp-content/uploads/2018/07/KidsEatSmartColour_Logo_340x156-300x138.png admin2015-01-06 19:57:022015-01-06 19:57:02New Year = New Menu!